Note: This commentary has been updated to incorporate the December data for Industrial Production. Today's report on Industrial Production for December shows a month-over-month increase of 0.8 percent (0.83 percent to two decimals), which was above the Investing.com consensus of a 0.6 percent increase. However, the previous month was revised downward from -0.4 percent to -0.7 percent. 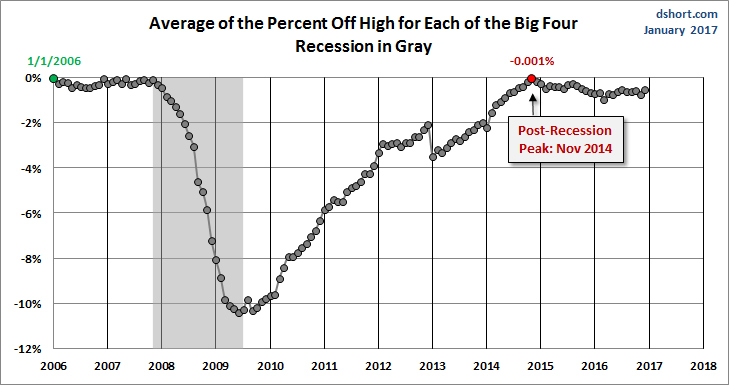 Industrial Production peaked in November 2014, only one point higher than its pre-recession peak in November 2007. It has contracted for 17 of the last 25 months. The year-over-year change is 0.5 percent, the first YoY increase after 15 consecutive months of YoY contraction. 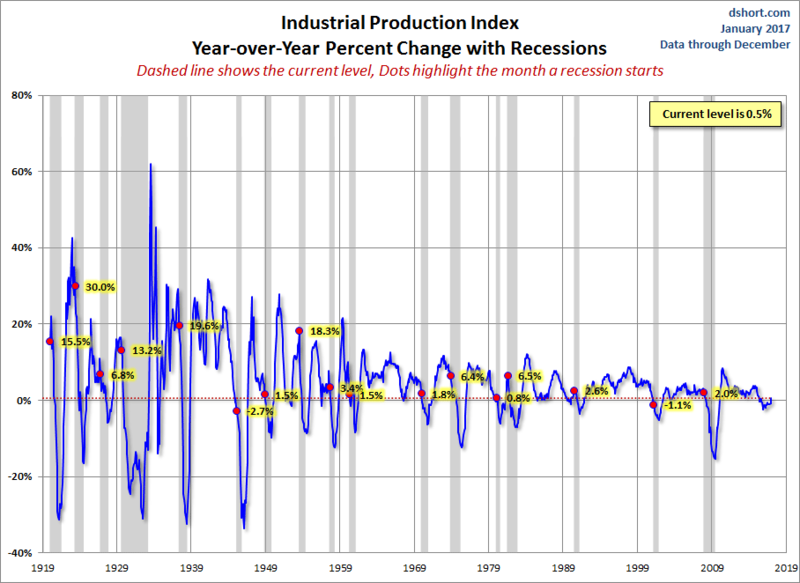 The chart below shows the year-over-year percent change in Industrial Production since the series inception in 1919, the current level is lower than at the onset of 15 of the 17 recessions over this time frame of nearly a century. The US economy has been slow in recovering from the Great Recession, and the overall picture has been a mixed bag for well over a year and counting. Employment and Income have been relatively strong. Real Retail Sales had been weak for many months but are now showing signs of improvement. 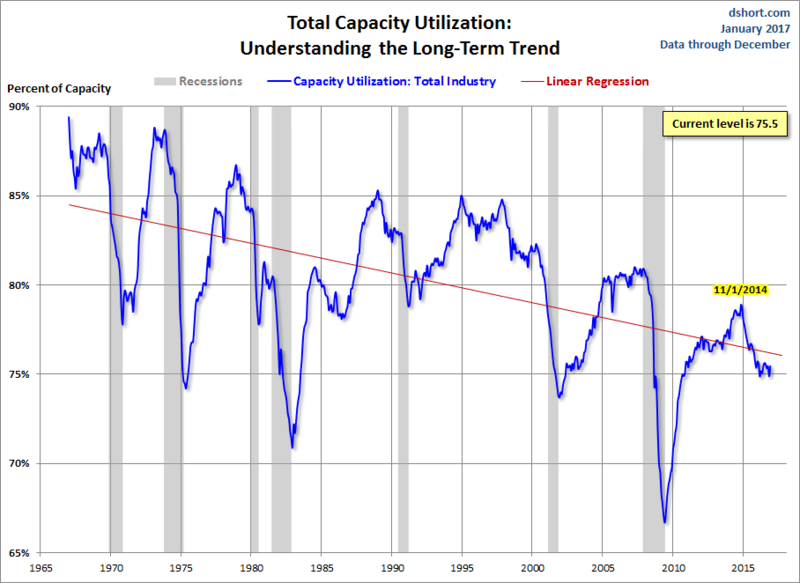 Despite the latest bounce, Industrial Production has essentially been in a recession. 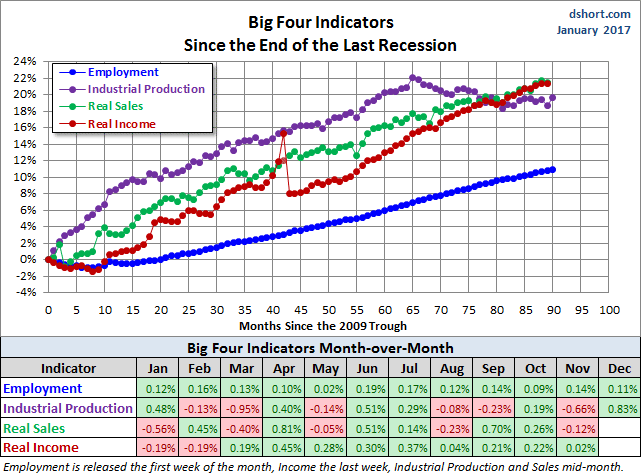 The next update of the Big Four will be the latest numbers for Real Retail Sales.